Having discovered the world of green woodworking, I have become fully immersed in the possibilities that these traditional techniques can offer. Using axes, knives and a foot powered lathe create items that have their own unique, warm character. I strive to make usable and beautiful woodenware, taking inspiration from historical work and also contemporary design. I feel that working with hand tools is an important aspect to the design process, making me work in more efficient ways. By physically handling the work piece, I find that I am constantly feeling for pleasing ergonomics and tactile surfaces. 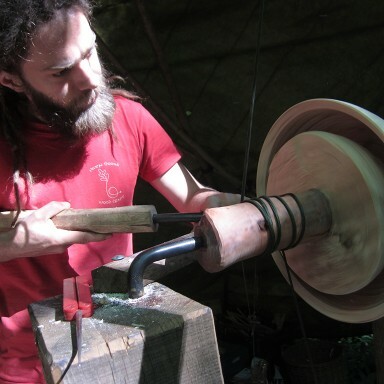 I work on a foot-powered pole lathe to turn bowls from fresh wood, creating beautiful items for everyday use. The tool marks become almost like the fingerprint of the maker, where every clean cut is an example of the years of practice. The subtle facets of a bowl can become like a familiar friend at meal times. Using wooden bowls and spoons for your food is a marvellous way to eat. There is something special about feeling the subtle facets of a wooden spoon in your hand and eating your food from a warm, charming wooden bowl.